In this short session, I look at quiz problems with cross holdings in them, hoping to clarify when you add, when you subtract and when you ignore cross holdings. This is a very short review session for the cross holdings problems on quiz too. These are the problems that usually give people the most trouble on the old question so I thought I'd take a selection of these prompts so you can see the different ways in which the problem can be presented. So let's take an easy example. This is an example where you given the information a publicly traded company that owns 60 percent of another company. The key is when you see the word numbers 50/60/70 percent. That usually means you have a majority holding over a company and accounting around the world requires that you consolidate your financials. In this particular problem you don't that they're both stable growth companies growing 2 percent a year in perpetuity given the same cost gap and for both. And they need given the key numbers for both companies. When you give it information for a company to cross holdings the key word you looking for are what kinds of financials I give you in this particular case I've given you the consolidated financials for Junnowhich is the parent company and vallum which is the subsidiary. The step given the standalone for the subsidiary. So given the operating income the book value of equity the debt and the cash and the problem basically is as as if you have a hundred million shares outstanding and you know what with the value put Shebby. Now I'm going to take it through two different ways in which you can solve this problem and you don't have to know both. But you can be comfortable with bond you can actually double check it. And so when you do a cross hold express yes first what you value the consolidated company. 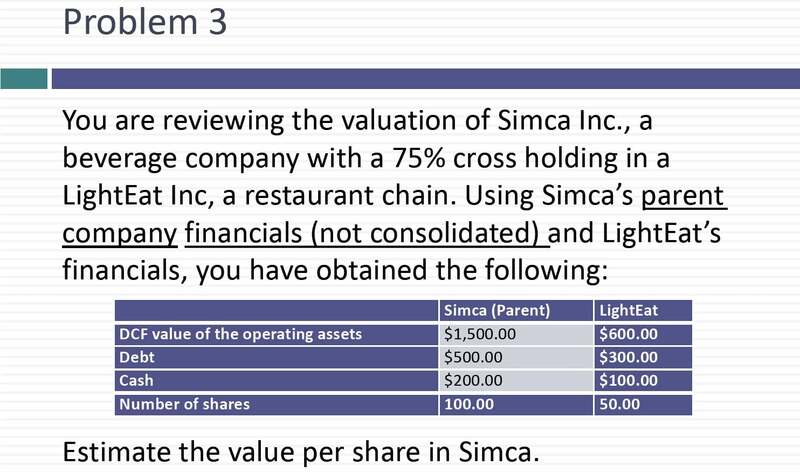 So in this case here's what I do I'll take the consolidated company in this case you know and I compute the return on capital and the reinvestment rate and I do a traditional valuation of the operating assets and I come up with the value. The operating assets side cash subtract our debt. I get a value for equity in the consolidated company. Then I value the subsidiary as a separate company to get a value of equity in the subsidiary company. Remember though that when I bought into a consolidated company I valued 100 percent of the subsidiary as part of my valuation. But I own only 60 percent. So the clean up for that. Yes. What I do I get the value of equity that I got for my consolidated company and I subtract our 40 percent of the value. So I'm subtracting out my estimated intrinsic value of the 40 percent that doesn't belong to me. So let's recap. When you value consolidated company of adding 100 percent to the subsidiary because you don't own 100 percent to subtract out the 40 percent that doesn't belong to you so be given the consolidated financials and you're given the subsidiary numbers. One way to do this is to value to consolidate and subtract out 40 percent of the subsidiary. What other way could you do it. You can actually strip out from the numbers I gave you the numbers for the parent company as a standalone company. So what I've done it is I picked the consolidated number subtracted out the subsidiary numbers. I get the numbers for just the pair I can value the parent and the subsidiary as standalone companies. So you see my valuations of the parent company valuation of the subsidiary valuation but you get the value of equity in June. Here's what I do. I'd take the value that I get from the pair. But remember now I haven't valued any of the subsidiary so I had to it 60 percent of the value of the subsidiary to get a value of equity. And you know I divide by the number of shares I get exactly the same value. So let's recap. When you have numbers for a consolidated and subsidiary you could Vandi to consolidate and subtract out the portion of the subsidiary that doesn't belong to you to get to the value of equity. Alternatively you can bet that the two companies are standalone companies in which case you take the value of the parent company and then you add the 60 percent of the subsidiary that block. I know it sounds incredibly confusing but take a look at the solutions work it through because it's easy to get confused about what you're doing and in many prom's you don't have a choice. The problem is so we'll tell you whether you given the pair that you don't have a choice of doing what we did here. But we do have a choice you can use either approach and you should get the same answer. It's like a second problem where you really didn't have much of a choice. So this chemical company that owns 70 percent of Adlerstein. So a chemical company owns a steel company. The 70 percent against the trigger that means you've consolidated things I don't tell you that with the consolidated financials you compute the value of the free cash flows of one point five billion. So you buy the consolidated company which means you buy 100 percent of Adlerstein when you come up with the that. Then I tell you that I can't give you the information of value Adlerstein as a standalone so you do what you did in the previous prom. But I tell you typically steel companies trade at one point six times book value. And I tell you what the minority interests Gerlach's shows on its balance sheet. I know this is messy and you remember accounting. But the minority interest that go like shows on its balance sheet is the book value.